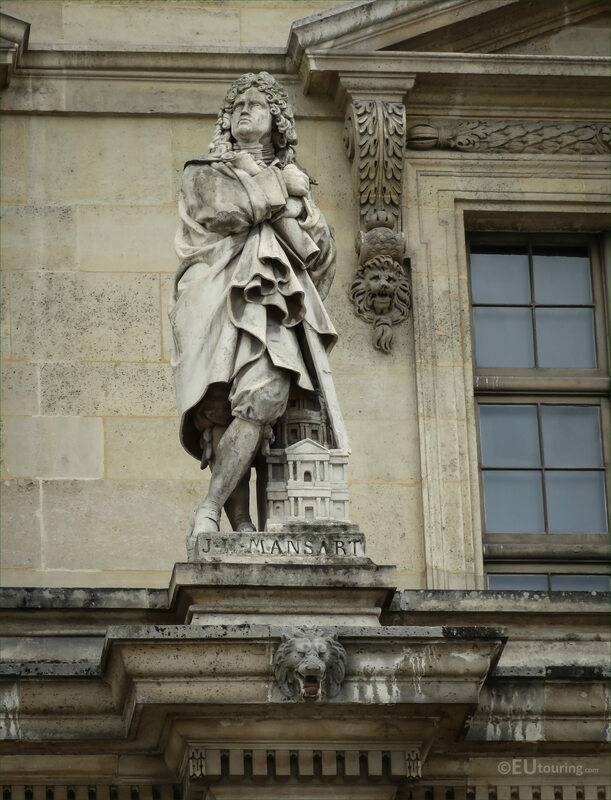 We were again within the Cour Napoleon of the Musee du Louvre, when we took these high definition photos showing a statue of J H Mansart by Jean Joseph Perraud, which is located on the Aile Mollien wing in the 1st Arrondissement of Paris. 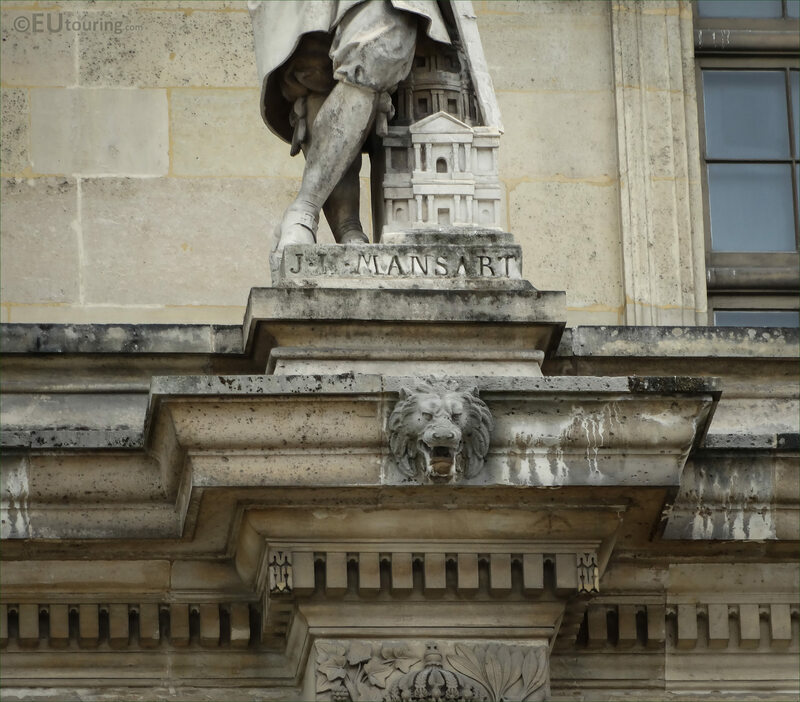 This first image shows the statue of Jules Hardouin Mansart, which is located on the first level facade of the Aile Mollien, second in from the left hand side, and this was produced by the French sculptor Jean Joseph Perraud and put in place in 1857 along with the other famous men in French history that are depicted on the wings of the former Palais du Louvre. So this close up of the statue shows the workmanship that went into producing this statue of Hardouin Mansart, and Jean Joseph Perraud was born in Jura in 1819 and became an academic sculptor producing numerous public works including a statue group for the Palais Garnier, and was awarded the Legion of Honour in 1867 and after passing away in 1876, he was then buried within the Montparnasse Cemetery in Paris. 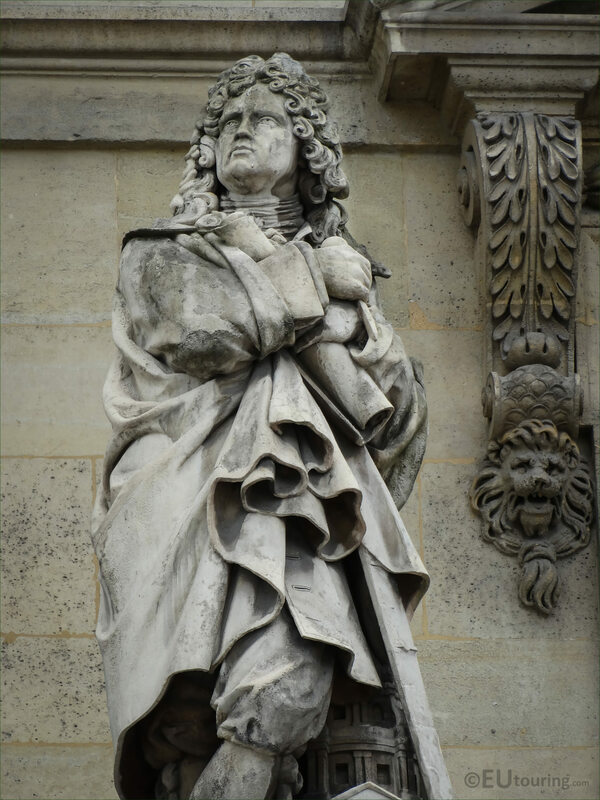 And in this last HD photo you can see the plaque on the base of the statue, which is dedicated to Jules Hardouin who was born in April 1646, and studying architecture under his great uncle Francois Mansart, in turn becoming an architect himself, and when Francois Mansart died, Jules Hardouin inherited his collections of plans and drawings, plus took on his respected name, so he became Jules Hardouin Mansart. Now Jules Hardouin Mansart served as the official chief architect to King Louis XIV working on famous tourist attractions in Paris including the Chateau Versailles with the Hall of Mirrors and the Grand Trianon, yet you can also see a model of a building by his feet in this image, which is a representation of the Eglise du Dome at Les Invalides, that he designed in 1680, and passing away in May 1708, he left a legacy of sumptuous buildings behind for people to enjoy even today.